When I read the description of Denise Grover Swank's new book The Curse Keepers, to be published 19 November 2013, I was immediately intrigued as I've always been fascinated with the story of the Lost Colony of Roanoke. However, I want to be absolutely frank, once I began reading the book I had a pretty hard time of it. 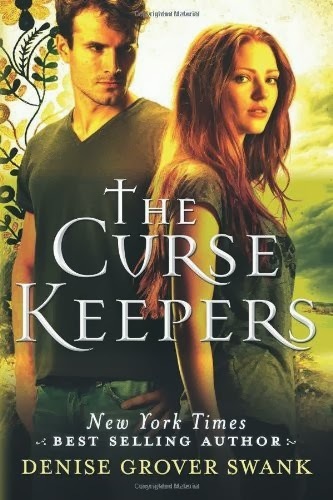 Swank's two main characters - Ellie Lancaster and Collin Dailey - are the Curse Keepers, the first in their families in 400 years to meet and trigger an ancient curse. One of the problems was that I found I could not relate (nor really like) either character. I understood that both had heavy loads to carry (Ellie's father's Alzheimer's and Collin's care of his family from a young age), however their introductory actions (Ellie's with her boyfriend and Collin's every time he argues with her), just did not engage me at all. In fact their constant arguing made me start to want to skip pages, which I never do. When there finally is romance, I found it almost anti-climatic, and had lost interest in both of them by that point in the story. I really wanted to like it more than I did, but found the Native American gods uninteresting, the slaughter of the birds horrific, and all in all, just didn't ever feel the story draw me in. I'm probably in the minority with this opinion, and I hope I am, as I admire Swank's previous books. From the set-up of the concluding chapter, I would guess she has a second Curse Keepers book planned. Perhaps that will fill in some of the blanks and the characters will evolve in a more likable way. For now though, I'm going to give The Curse Keepers three stars for originality and creating a story around one of America's great mysteries.